The Meiji University Liberty Academy was founded in April 1999 to foster an "intellectual environment at Meiji University towards a 'Lifelong Education Style University'" that networked the University's massive intellectual property and lifelong education departments such as its graduate schools, libraries and museums. The Academy appropriately grasps the will and demand of high-level specialized working people for continuous education programs to develop their work skills so they can be fully active in the harsh corporate world. Meanwhile, the University is aware that education programs must be readied in response to the desire to systematically learn about the existence of humanity and the spirit, a result of a double-edged relationship with the advent of our advanced professional society. At Liberty Academy, Meiji University teachers serve as coordinators to provide "university education and research results" in continuous and systematic public education programs to the business and local communities while seeking to create an "open university" by opening up the various intellectual properties held by the University and its encompassing environments broadly to city residents. The University also has ongoing activities to support study for national and public service qualifying exams for university students and graduates in the aim of supporting continuous learning after graduation. From business programs for advanced, specialized business people to technical lecture courses by University lecturers, the Academy offers a wide variety of courses. Qualification exam preparatory courses and language courses such as for the TOEIC exam, etc. are also offered. A membership system is used for Liberty Academy courses, and one of the benefits of membership is library privilege, among others. "Meiji University e-Seminars" public courses are broadcast via broadband as distance courses using the Internet. The University also runs real-time joint lecture courses via a video classroom system with Iida City in Nagano Prefecture as part of the "Meiji University/Iida University of Industry and Technology" program to train individuals to work in industry. Meiji University accepts "contract training for universities, etc. ", a type of contract training from the Ministry of Health, Labour and Welfare and holds re-employment support education in a curriculum over three months at the University itself. University facilities such as libraries are opened and exchanges between teachers and business lecturers is deepened while supporting re-employment from the campus. Public lectures managed by donations from companies, organizations, etc. have the donor company name incorporated into the name of the lecture. One highly popular program is a joint curriculum with University teachers and business lecturers of donor companies. Campus facilities are also used during the summer break for contracting and running of training to develop business executives. Meiji University offers lectures and seminars, etc. with localities as part of its open university activities. 400th Anniversary of the Edo Shogunate, NPO Kanda-Gakkai, Kanda Branch of the Tokyo Antiquarian Booksellers Association, Edo-Tokyo Museum, etc. Meiji University sends lecturers to citizen's college courses sponsored by city halls and centers of regional municipalities. 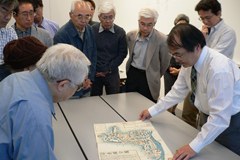 From fiscal 1997, a citizen's college plan by Narita City, Chiba Prefecture has been contracted and every year 150 people enter and engage in continuous learning at the "Meiji University/Narita University for Adults", which offers a curriculum of three courses: international society, regional society, and green environments.